2. You are regimented and inflexible. 3. You get everything done that you want to. 4. Being organized prevents problems. 6. You are more efficient. 7. You can’t be spontaneous. 8. Some people just can’t get organized; being organized is a genetic trait. 9. It takes a lot of time and effort. 10. You have to schedule every minute of the day. 11. You are controlling and critical of others. 12. You are not very sentimental. 13. It costs a lot of money. 14. It is only for logic-based thinkers, not creative types. 15. It makes you are a happier person. 16. It proves you are not lazy. 17. You have to have a good memory. 18. Being organized means you handle items only once. 19. It is not possible for visually-oriented people. 20. Being organized fine for work, but is unnecessary at home. 21. If you are organized, everything is always clean. 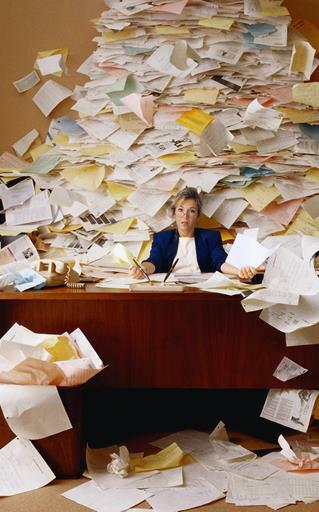 You may know organized people who have many of these traits, but many disorganized people do as well! Are these misconceptions? Please comment to let us know what you think. The bottom line for me is simple. I can’t think clearly in clutter. Granted I’m not like June Clever BUT my rule is simple— put it away or throw it away. You are right, Cindy, the key to decluttering is to make a decision! I used to think I was pretty organized… then my grandsons moved in with their dog and my business began to grow, and then there was social media marketing and I’m falling behind on being organized – LOL! Love your post here! I will be taking more of your suggestions to heart! “Being” organized is an evolving process for all of us! This is a great list of reasons why organizing tips don’t work for everyone! We all have our own ideas of what “organization” means — and how we like to access and retrieve anything and everything in our lives. For me, visual is important; I need the visual cues to help me orient and access what I want. That sometimes means my office space looks cluttered, but if it’s all “put away” I can’t work well and feel scattered. I actually think #15 is true, at least for me. I am so much less stressed when I am organized and am therefore a happier person. My day can go down pretty fast if I”m looking for something that is buried under papers on the kitchen table. On the other hand, if I’ve put something away and know exactly where to find it, it really does make me happy. I wasn’t born organized, so I still tend toward clutter. Whenever I find I’m “spinning my wheels,” unable to focus, it is usually because I’ve let clutter gain the upper hand! The older I get, the less organized I feel. I think it is not directly related to age, but the amount of responsibilities I heap upon myself. I definitely feel more at ease and self assured when my home is de-cluttered. A false sense of control I suppose. It’s not necessarily a false sense, Cynthia! It really depends on what you have done with the clutter. Some people stash clutter in boxes, drawers, cupboards — even whole rooms! Outwardly, they seem organized, but it’s no their reality! I’m always amazed to find some (though not many, thank goodness!) “professional” organizers are not organized at all — kind of a “those who can’t do, teach” philosophy! Are these misconceptions or actually stereotypes of what it means to be organized? Whether or not we feel organized or not is very personal. It is something we each define for ourselves, something that originates from within. Because our inner world is constantly changing so too will our sense of whether or not we’re feeling organized or not. We can look at someone’s life and think “she’s very organized”, however, she may feel very unorganized, given the context of her own criteria. You are spot on, Carol! Being organized is a tool, like a map, to get us where we want to be, so it is going to look different to each individual! Yes, we who work from home do have our challenges. And to have kids (with or without paws!) adds to the fun! My husband is the born organized one; I’ve had to learn! Fortunately, he has become more tolerant of clutter, while I have become LESS tolerant of clutter!